Halloween can be one of the most fun holidays of the year. It can also be one of the scariest – and I am not talking about the costumes. Halloween is a night for pranks and tricks that could be meant to be fun, but some people are not wearing masks for fun and they are not going door to door in search of candy. In fact, some unsavory characters much prefer it if you are not home at all. They are looking for things that are far more valuable than candy. 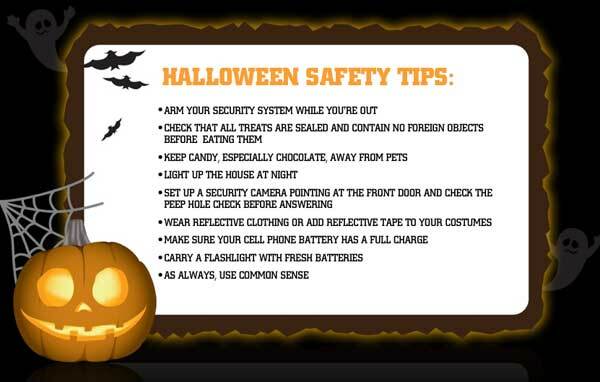 You need to keep your family and home safe whether you are out collecting candy, or home trying to avoid the doorbell. As fun as Halloween can be, there are some very real dangers lurking in wait for children. You might want to think the best of strangers who are handing out treats, but not everyone has the same definition of ‘fun’, so you need to be aware and protect your children. Here are some Halloween safety tips to keep you and yours safe this spooky night. Check all treats before eating. Children should have their treats checked by adults before they eat them. Just to be safe, you might even want to consider tossing out anything that doesn’t come in a pre-wrapped package. Light up the night. Make your children easily visible with flashlights or glow sticks. Some restaurants and fast food places even give away transparent bags for candy that include a glow stick you can put inside the bag. This limits the amount of things your child has to carry, but allows you to easily view them. Consider an alternative to trick-or-treat. You don’t have to take your children out to collect candy from strangers. Instead, you might take them to a haunted house or a hay ride. If you do take them out, consider taking them to friends and relatives so you don’t have to worry about what they may get in their bag. Host your own Halloween. 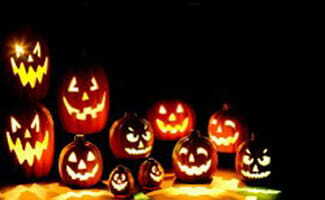 If you want to be able to keep your home and children safe at the same time, consider having your own Halloween party. This will allow you to choose what they get for Halloween and who they are around. Halloween is a very tricky time. If you leave the porch light on, people will come knocking for candy whether you are there or not. And yet, if you leave the house, you want to leave your porch light on for safety reasons. You may have to take different measures if you don’t want people to know you are not home and you don’t want people on your front porch while you are gone. Whether or not you have plans to go out on Halloween night, be sure to keep your home well lit. Turn on a few lights around your home to give the impression that someone is home and still awake. Additionally, well-lit areas outside your home will deter potential intruders or malicious pranksters by eliminating hiding places caused by shadows. Now is the perfect time to upgrade or add devices to your security system before Halloween gets here. Why the paranoia? Halloween is the one time of year when random strangers wander your neighborhood wearing masks and not drawing attention to the fact that their identity is hidden. You don’t want to fall victim to someone just because you did not make yourself aware of the time we live in and deal with your security system in a way that would keep your family safe. Adjust your security camera settings. If you have security cameras, you may want to adjust the areas that they are focused on. For instance, you might want to keep cameras on the doors and windows, but you also might want to put some focus on the streets around your house so that if any pranks are pulled, you can see where they came from and maybe even see who did them. Toilet paper rolls can be thrown from the street, as can eggs and other creative items. Make use of your timers. If you have timers on your lights, take care to have specific rooms light up every now and then. For instance, leave the living room light and television on, but use a timer to light up the kitchen light every now and then so that it looks like there are people in the house going to get a snack every now and then. Arm your security system. The excitement of getting ready for Halloween plans may make us forget to take simple safety precautions. Make sure to arm your security system (and lock doors and windows) before you leave your home. Cell phones are great for keeping you secure when you are out of the house. If your child does not have a cell phone and you are not the one taking him or her trick-or-treating, allow your child to borrow your phone. Check the charge. If your child has a cell phone, make sure it is fully charged. You might also want to make sure that he or she is in an area with good signal reception. Check your security system on a regular basis. A high quality wireless security system will allow you to check in on your security system on Halloween from your phone. You can even get alerts to let you know if something is happening in your home. While you can also do this from a computer, you probably don’t want to carry your laptop as you take your kids out hunting for candy. You hate to imagine that criminal people will come to your door on Halloween, but it could happen. This is another instance when you can make great use of your security cameras. If you want to take serious preventative measures, you can observe the entire exchange of candy from inside your home. You can leave a bowl of candy on the porch with a sign that tells the children how many items they can take. You could mention that you are observing from inside through use of the video camera. If you do sit on the porch, keep your cell phone close by and try to sit with a friend or family member so that you are not alone. There is always safety in numbers. In addition to the measures mentioned above, be sure to use some common sense on Halloween. Make sure your children stay away from strange neighborhoods and they should never go inside someone’s house. There is no kind of candy that is worth a security risk. Try to travel with a group for maximum safety. If you have a home security system, make effective use of it. If you don’t have a home security system, now is a great time consider getting at least minimal protection.